Bring your own drinking water as potable water is not available in the park. All surface water from the river must be boiled, filtered or treated prior to consumption. Marble River Provincial Park on northern Vancouver Island offers excellent opportunities for wilderness hiking, biking, wildlife viewing and fishing. Marble River Provincial Park is also a very popular destination for recreational angling, including fly fishing on the river and tidal water fishing in the marine portion of the park. Chinook and coho salmon, steelhead, cutthroat, rainbow and Dolly Varden trout can all be caught in this park. The Marble River Trail contains a number of angler-access routes down to the river, which is considered to be one of the best steelhead fishing rivers on Vancouver Island. The most popular fly-fishing location, known as the Emerald Pools, is located at the end of the trail. Walk-in wilderness camping is allowed, and a Western Forest Products Recreation Site offers vehicle-accessible camping adjacent to the park. Marble River Provincial Park is located on northern Vancouver Island, at the juncture of Rupert Inlet, Holberg Inlet, Quatsino Sound and Neroutsos Inlet. The park is located approximately 15 km north of Port Alice and 35 km southwest of Port Hardy. The park can also be accessed by boat from Coal Harbour. Boaters can reference marine chart #3679 (Quatsino Sound) and the more detailed chart for Quatsino Narrows, #3681 (Plans Quatsino Sound). Cultural Heritage: Marble River Provincial Park lies in the traditional territory of the Quatsino First Nations. Conservation: The Marble River flows through a shallow canyon bordered by forest covered bench lands. The park helps preserve spawning and rearing habitat for a variety of fish species and contains portions of the most important Chinook salmon producing system on the west coast of Vancouver Island. The park also contains relatively rare and unique karst features and contributes 56% of the protected habitat within the under-represented Coastal Western Hemlock very wet maritime biogeoclimatic variant in the Nahwitti lowlands ecosection. 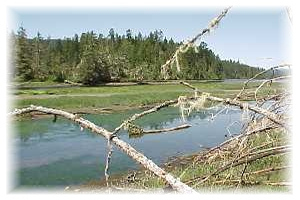 Wildlife: The park protects fish and wildlife values associated with the river and estuary, including Bald eagle nesting habitat near Quatsino Narrows, steelhead fishery and salmon spawning and rearing habitat, as well as waterfowl habitat. Opportunities for ocean kayaking and canoeing exist in the marine portion of the park, which includes Varney Bay and Quatsino Narrows. The 4.2 km Marble River Trail has been designed to accommodate both mountain bikers and hikers. Please obey all signs related to mountain biking safety and ethics. Marble River Provincial Park is a very popular destination for recreational angling, including fly fishing on the river and tidal water fishing in the marine portion of the park. Chinook and coho salmon, steelhead, cutthroat, rainbow and Dolly Varden trout can all be caught in this park. The Marble River Trail contains a number of angler-access routes down to the river. The most popular fly-fishing location, known as the Emerald Pools, is located at the end of the trail. Caution: Anglers should be aware that black bears frequent the area along the river’s edge, especially during spawning season. There is a hiking and biking trail that starts at the end of the upper loop of the Western Forest Products Recreation Site. The trail is 4.2 km; average hiking time one way: 1.5 hours. The trail is generally in good condition but windfall and other debris may be present, so please use extra caution. Portions of this park are open to hunting for specific species. Hunters must have valid licences and tags. Please refer to the current Hunting and Trapping Regulations and Synopsis publication for closures and regulation. Ocean swimming. There are no designated swimming area at this park. There are no lifeguards on duty at provincial parks.